Ultima Junior Chicken and Rice is a complete and balanced dry food for kittens. Kittens grow incredibly fast in their first year and to ensure that they grow and that their organs develop in a healthy way, you need to make sure that they are eating a food that is adapted to their needs. 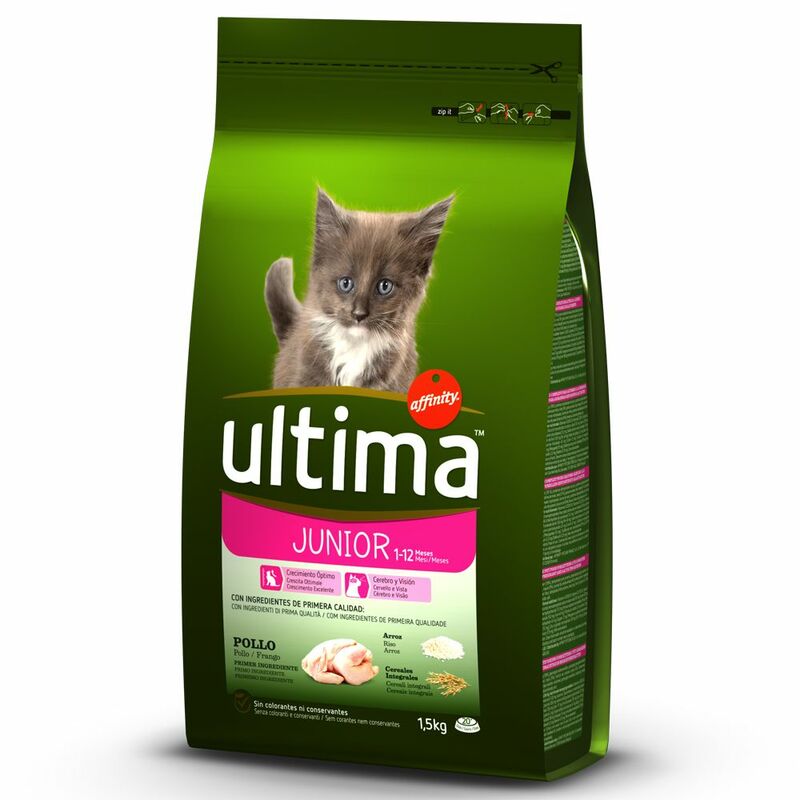 Ultima Junior Chicken and Rice is made up of a large proportion of eΒential proteins from chicken, that help to ensure that your kitten gets enough energy from its food, to build healthy muscle. In addition it contains a unique blend of antioxidants, vitamins and minerals for balanced nutrition, and the wholegrain cereals in the food can help to promote healthy gut flora. Added taurine and polyunsaturated DHA from fish oils promote healthy eyesight and heart function. As with all of the ultima products, only the best ingredients have been used in the production of this kibble for kittens, adhering to strict quality controls. The product is gently steam cooked to preserve the natural nutrients and flavours of the original ingredients. The food is packaged in resealable pouches, to keep the kibble fresh for a long time after the pack is first opened. Ultiman Junior Chicken and Rice at a glance: Complete dry food for growing kittens and lactating or pregnant cats Nutrient dense formulation to support the growth phase High quality sources of protein: from chicken to provide enough energy for your kitten's needs, and help to build healthy muscle With DHA and taurine: promotes healthy brain and eyesight development Balanced nutrition: ideal combination of proteins, vitamins, and minerals such as iron, magnesium and copper, for all-round healthy development With wholegrains: a great source of carbohydrate that also help to regulate the digestive system Gently steam cooked: to preserve nutrients and flavour High quality and safety: strictly quality controlled manufacturing proceΒes Resealable pouch: for freshneΒ Small kibble: sized for kittens and oven-dried Does not contain artificial colours or preservatives.